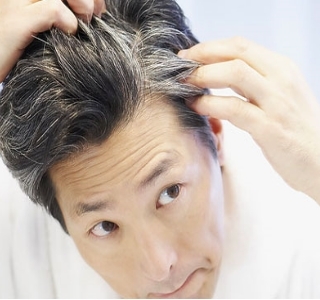 "15 Remedies for Grey/White Hair"
*Premature greying of the hair is basically hereditary. So if your father's or grandfather's hair started early to turn grey there is a chance that your will also have premature greying of hair. *Excessive prolonged stress, anxiety and tension. *Sever illness like typhoid too can start greying of hair. *Excessive intake of tea, coffee and alcohol. *Excessive intake of fried and oily foods. *Excessive intake of sour and acidic foods. *Deficiency of nutrients especially copper can reduce the production of melanin. 1.Eat foods rich in Protein, iron, minerals, iodine and vitamin A and B. *Vitamin A Sources: dark green vegetables & yellow fruits such as broccoli, spinach, carrots, squash, sweet potatoes, pumpkin and apricots. *Vitamin B Sources: fresh green leafy vegetables, bananas, tomatoes, cauliflower, cereals, liver, kidney, yogurt, yeast and wheat germ. *Proteins Sources: sprouted whole grains, cereals, meat and soy in your diet. Minerals like zinc, iron and copper. *Zinc Sources: red meat, chicken & green vegetables. *Iron Sources: beef, dried apricots, red meat, parsley, eggs, wheat & sunflower seeds. *Copper Sources: sunflower seeds, cashews, almonds, crabs and oysters, egg yolk & whole grains. *Iodine sources: banana, carrots and fish. 2.Lemon juice mixed with Gooseberry (amla) powder applied on the scalp for few days helps grey hair to turn black gradually. 3.Drinking butter milk with 2 teaspoons each of yeast and wheat germ will prevent and cure premature greying of hair. 4.Rub Indian gooseberry (amla) mixed in coconut oil (boil some dried amla pieces in coconut oil till it turns black) into the scalp regularly. It can show wonderful results. 5.Grate some fresh ginger. Mix with honey and place it in a jar. Eat 1 tea spoon everyday. 6.Applying Onion paste on the scalp for few days before taking bath helps grey hair to turn black gradually. 7.Massage your hairs with coconut oil and lemon juice everyday. 8.Eating Sesame (Til) seeds daily and applying its oil regularly helps grey hair to turn black. 9.Eating Fenugreek (methi) sprouts regularly and applying Fenugreek paste on the scalp an hour before taking bath once in a week helps to overcome grey hair problem. 10.Boil some dried ridge gourd (tori) in coconut oil till it turns black. Massage this oil in scalp and hair roots. 11.Durva (Dub, a grass used to worship Lord Ganesha) paste applied before taking bath regularly helps grey hair to turn black gradually. 12.Mix 1 tablespoon of table salt to a cup of strong black tea without milk. Massage this water on the scalp. Wash your hair after an hour. 13.Regular application of Henna (Mehandi) paste applied an hour before taking bath helps grey hair to turn black slowly. 14.Neem (Indian lilac) seeds grinded and applied on the scalp and boiled neem leaves used for washing hair helps grey hair to turn black slowly.